We in the library biz use barcodes to track our collections all the time. We still make mistakes sometimes, but we wouldn’t be efficient without them. 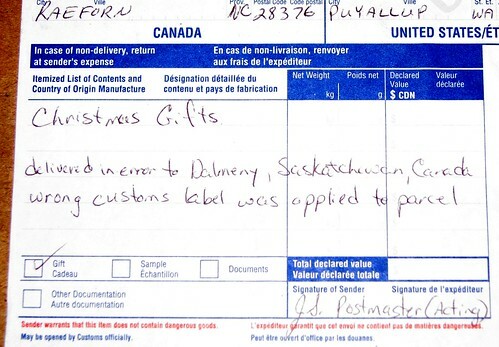 So I’m sympathetic to the folks at the postal services in two different countries who accidentally delivered our package to Dalmeny, Saskatchewan after it was sent from North Carolina. It was supposed to go to Puyallup, WA – 1,100 miles away from Dalmeny – but someone slapped the wrong barcode on the label. In this case it took a human eye to catch the human error, while the automation in between dutifully routed it across the border. This entry was posted on Wednesday, January 23rd, 2008 at 8:52 am and is filed under humor, personal. You can follow any responses to this entry through the RSS 2.0 feed. You can leave a response, or trackback from your own site. It could have been worse ….it could have ended up at Dalmeny, just outside Edinburgh, Scotland! Musical Tag Clouds: A New Game?